Note: this document applies to version 6.x of Team Password Manager. If your version of Team Password Manager is lower than this one, please check this document: Granting access to passwords and projects. Previous versions of Team Password Manager (lower than V6) had a very simple security model, mainly based on granting access to passwords and projects. V6 security model is more complete and defines permissions, which allow a better definition of access to passwords and projects. This document describes the security/permissions model in Team Password Manager V6 and up. Not defined/set: the permissions on a project are not set. The effective permission on a project is then calculated from groups. If the resulting permission from groups is also not defined, no access is given. No access: the user/group doesn't have access to the project or any of its passwords. The name of the project may be seen if the user/group has access to any of its passwords. Traverse: the user/group can see the project name only. Used to traverse the project to its subprojects (subprojects can be seen in the projects tree) and for project managers/it users create subprojects in it without having access to any of their data and passwords. Read: the user/group can read project data and download files and see the passwords of the project (but not create). Read / Create passwords: the user/group can read project data and download files, read the passwords of the project and create passwords in it. Read / Edit passwords data: the user/group can read project data and download files, and edit data from its passwords. Can also create passwords. Read / Manage passwords: the user/group can read project data and download files, and manage its passwords. Can also create passwords. 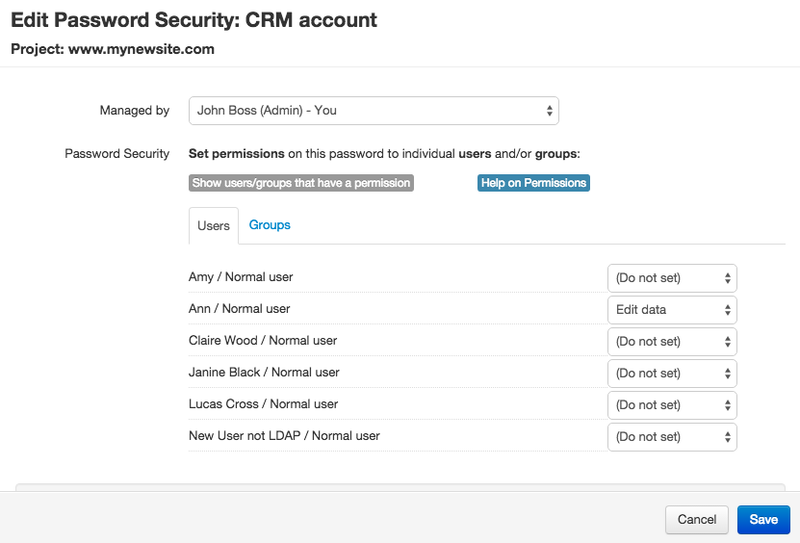 Manage (default for the creator): total access and control over the project and its passwords. Normal users with manage permission cannot move the project to another parent, create subprojects inside it or delete it. Only leaf projects can be deleted. Inherit: inherits the permission set in the parent project. Note that this doesn't mean that it will inherit the effective permission in the parent project, but the one that's set there. This permission doesn't apply to projects that don't have a parent (first level or root projects). Permissions can be defined globally for all the users (which will also apply to new users) or to individual users and groups. Not defined/set (default): the permissions on a password are not set. When this happens, the permissions are defined by group membership or from the project. No access: the user/group can't see anything from the password (not even the name). Read: the user/group can read data from the password and download files. Edit data: can edit data and upload files but can't do anything else with the password (set custom fields, lock, delete, etc.). Manage (default for the creator): total access and control over the password. Users/groups with manage permission on the project have this permission on the password. Note that if a user is a manager in the password's project, he/she has by default "Manage" permission on the password, and this cannot be overriden in the password. 1. A user permission takes precedence over a group permission. 2. If there are different permissions in different groups, the one with most access takes precedence. 3. A specific password permission takes precedence over the one set in the project for its passwords. Exception: if a user has "manage" permission over the project of the password, this takes precedence. Result: the user will be able to edit the data for all the passwords except for password X, on which he doesn't have access. Versions below V6 had a global setting called "Editing Policy" that regulated how users could manage a password: if anyone that had access to a password could manage it or if only its manager could manage it. This setting in V6 disappears because this can be controlled explicitly in each project/password using the provided permissions. If upgrading from previous versions, the upgrade process will take care of assigning the correct permissions depending on your editing policy setting value.